the motor for the rotation of the disk is a SONY MODEL MP-F17W-04 SMM Made in Malaysia 4-617-642-30 .
in front there is an orange led. Please Refer to this documentation (Shift-Click to Download , 532 Kb) to get information about the Sony Floppies Jumper Configuration : Note for a P.C. 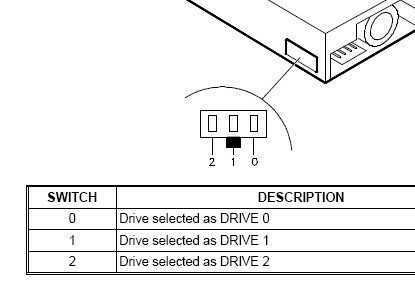 Computer you need to select the slide switch at the DS/1 Position, and for an Atari Microcomputer you need to select DS/0 Position (which is the position the nearest from the card end side).